On a separate thread, yesterday I mentioned my first efforts at slug control/reduction. Decided to give it a separate thread today. First of all there are several good threads related to slug control, so if looking for info, do a quick search on this forum's search feature. In the past, yesterday especially drove home the fact, that snails just love to spend the day in dark, relately cool, open spaces or cavities. 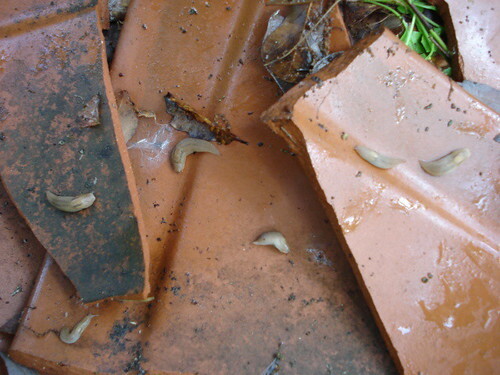 Yesterday while unstacking two nestled clay pots, I hit a gold mine of at least twenty slugs. First, the number of slugs was alarming, and secondly, the ease of gathering and destroying them was a revelation. After that experience, I walked the yard and garden, looking for potential slug havens. Amost every clay pot or clay pot fragment had between one and a dozen snails underneath. I also have some large rectangular planters that hold about a 12 inch depth of soil. I imagine that provides some insulating coolness, plus the molded feet create about a one inch space. Both yesterday and today, those spaces housed as many as 10-20 slugs each. The slugs have only done superficial damage to any of my crops, so thus far I have not really considered them to be such a bad pest. Am especially surprised at limited damage, given the huge number that inhabit various parts of the yard and garden. Anyway, this experience is giving rise to a two pronged attack on these abundant pests. First, I'll place nestled clay pots of two each in various locations around the garden. Also will place broken curved section of pots, curve down, at select locations around all gardens of concern. Third will try out a couple of covered beer traps. Will likely just set a shallow container of beer underneath a clay pot, to keep the rain from washing contents away. I place a small stick under one side of the inverted rim of each pot to allow easy access for the slugs. Each day I'll walk the garden with my slug soup mixture of water and chemical fertilizer, which kills much quicker than salt water and only takes a bit, will gather the slugs and give them a quick end. Yesterday between 100 and 150 slugs were gathered. Today between 50-100 were gathered. Will be interesting to track the numbers harvested over time. Slug motel. Pieces of clay pots. Turned over to get the day's harvest. Kind of makes me think of a couple of Alfred Hitchcock productions. The first of course is 'Psycho'. The snails move into their comfortable motel, only to have the wall slide away, and then terror. The second was from the Hitchcock television series. The husband supposedly commits the perfect crime, no body, no murder was the theme. He kills his wife, cuts her into small pieces. Then he brings in commercial jars of acids and bases. He first dissolves her hair and all tissues with the highly caustic sodium hydroxide. Then he uses sulfuric acid or an acid medley to disolve the bones. He does this all in the tub and sends the remains right down the drain. Kind of like the affect of my fertilizer bath on the slugs. That says something about Hitchcock and his genious. I saw both of those films only once, when pretty young, perhaps 12 or 14 years old or younger, and the images and many details still linger strongly in my mind and imagination. Last edited by hendi_alex on Sat Jun 06, 2009 8:38 pm, edited 1 time in total. Now I have a use for those broken terracotta pots! Thanks. Oh, so you mean instead of storing the unused pots in the shed or leaving them lined up on the patio in case I have the urge to pot something I should really be leaving them around the garden! My slug issues have decreased somewhat -- I'm guessing either my earlier efforts have helped to reduce the number (I should hope so!) or most of the plants have outgrown them to the point that they keep growing despite the little bites here and there. Right now I'm cheering the bush beans on -- they seem to do much better after 4th set of true leaves. Maybe I should be doing the midnight Totoro dance. Some things are best kept secret. Of course, I was also a chemistry teacher, perhaps an interest stimulated by all of those exciting bottles that would disolve most anything! During my teaching career, handled gallon or perhaps 4L bottles that looked identical to those in the film: sulfuric acid, nitric acid, hydrochloric acid, sodium hydroxide, potassium hydroxide, etc. Sometimes just for fun, would see what things I could make 'disappear.' Was that just practice for some devious future plan? Oh, gotta go. Wife's making some of her delicious home made chocolate chip muffins. Guess she's safe for at least another day. Oh and it sounds like you are a very intellectual person. "Oh and it sounds like you are a very intellectual person." Just goes to show how easy it is to get a distorted impression of a poster on the internet! Just listen to one of my walks around the yard, with my 'quaint' southern drawl, and obvious butchering of the King's English, and you will be closer to the truth of the matter. Don't be so modest Alex. It is refreshing to hear a different accent. Just been able to hear your voice. I said to hubby that I can't listen to the videos because the sound system doesn't work but he said it was muted - I bet you think I'm a bit thick eh? That is one thing that I can thank my dad for. He passed on an outlook that basically says [don't pay anyone to do something that you can do for yourself.] He also felt that through careful observation and patience, a person could do most anything himself/herself. That kind of outlook certainly makes a person more self sufficient and also allows one to live much higher than would otherwise be possible on whatever income is available. You may enjoy some photos from my flickr site of my latest ambitious project. I have been renovating my daughter's new home by stripping down to the studs and subfloor, replacing the plumbing, electrical, insulation. Have been redesigning and re-constructing beam/roof areas in several parts of the house. Have been completing all phases of the work mostly alone with wife and daughter as helpers. Has been quite a project over the past year but is finally coming back together. Here is yours truly in the kitchen area after demolition kitchen and dining and removing the partition between. That was late last summer. My flickr site shows a lot of before, deconstruction, and construction photos if interested. 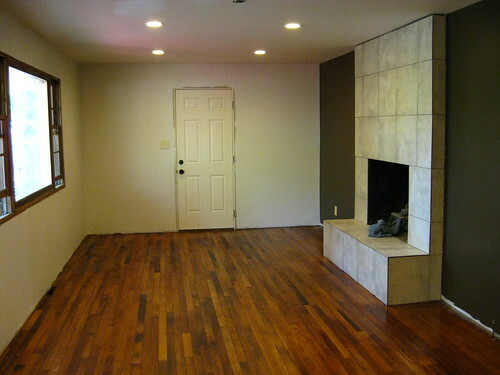 This photo shows the den just after we completed refinishing the oak floor a few weeks ago. Have since replaced most of the trim work. My daughter's site has many other photos of the project. Needless to say has kept my wife and me busy since April of last year. Over that time we have generally driven the three hour trip and stayed two or three days per week. The demolition work was the hardest, hottest, and most time consuming. 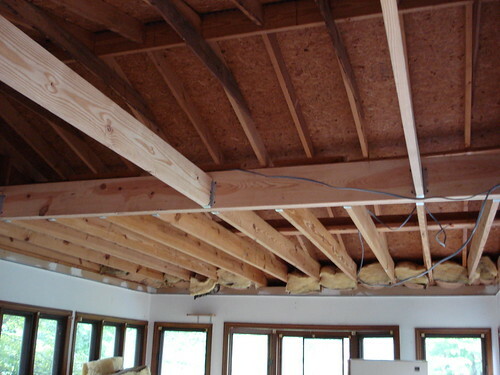 The deconstruction of the overhead beams and joists was the most technically difficult. The finishing of the sheetrock required the most patience. These shots from my daughter's site show more before shots and mostly construction progress. Here is that pretty difficult beam reconstruction job in progress. Area in the forground contained a sloped roof covered in tar and gravel with joists underneath. Took me a huge amount of time and energy, in the 110 degree (35-40 degree Celsius) heat to chip that out a small piece at a time. Placing the large central beam was no simple task, with just me and my 45 kg wife. Was a terribly difficult job mostly from start to finish! Watched the vids - thanks. You remind me very much of my brother - well both brothers actually. Keith especially. He is now 56 approaching 57 years old (13 years older than myself) and is a time served joiner. Have you heard of an 'est wing hammer'? and, do you have one? Apparently, over here, you can't live without one. Myself, just bought a basic hammer from the hardware store, what do I know? He too has revamped his and his daughters house. Just like yourself, he has re-piped, re-plumbed, stripped walls and plaster and ceilings and everything. He is a perfectionist, won't settle for second best, it has to be perfect and right! Love the cveiling fans that were in the vids, we have them in the kitchen and bedrooms. You may think that seeing as England is cool most of the time - sometimes it gets very hot but because the temps change so rapidly, we can't acclimatise as quickly and so ceiling fans help quite a lot. Love the ceiling lights, very posh. Is that your little doggy and what his her/his name? Noticed that you kept changing the colour on the walls of the fire side wall, was that because your daughter wasn't sure about the colour? I take it that you made the kitchen cabinet doors. I loved the way they were stained. Who was staining them? And.. who was dancing on the wooden cleaner/polisher with you? Oh, and your wife has by the sound of it a lovely slimline figure. I am 5'7" tall and weigh 67kg.